The remarkably affordable & compact MasterTemp 125 heater gives you equivalent energy savings and advanced operating features previously only available from much larger & more expensive gas heaters. Ideal for bodies of water such as pools or spa's up to 15,000 gallons / 68m3 the MasterTemp will deliver a dependable & consistent heat-up service irrespective of the weather for many domestic pools. Manufactured by Pentair, arguably the worlds largest & most technologically advanced swimming pool & aquatic equipment manufacturers, the MasterTemp combines decades of real world experience & field feedback. With its revolutionary pre-mixed gas combustion technology, the MasterTemp 125 Heater offers 83% thermal efficiency, the highest in its class. The MasterTemp® 125 is designed to be as quiet & unobtrusive as possible so as not to intrude on your leisure time. The rotating digital display / controller provides far more information and better control than previously seen within this marketplace. The display is clearly visible in most any conditions & can deliver information rich data (if you really want it too). MasterTemp® 125 heaters are designed with a direct ignition device, HSI (hot-surface ignition), which eliminates the need for a standing pilot. 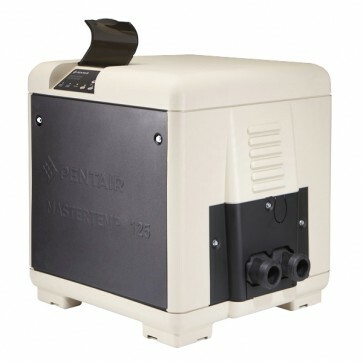 The MasterTemp® 125 heater merely requires an external power source (120 / 240 V AC) to operate. -Only 23" high! ; Among the biggest gripes are that people like you do not want to see a large, rusting box by the pool. In the past they have been hidden in sheds or out buildings but now thanks to its diminutive dimensions this is no longer a complaint. Outside it features an unobtrusive composite shell that is resistant to UV fading & cracking as well as the extremes of temperature seen throughout the year, even if left turned off during winter it will remain ready for the spring. Inside its internal Cupro-Nickel heat exchangers ensure high resistance to swimming pool water which can be quite aggressive at times all the while offering a great heat transfer rate. Many features are built into the MasterTemp® 125 to protect you, your family & the boiler itself. Anomaly's that cause a shut down are rare but not hard to detect as they are reported via the control panel for easy fault rectification. Pressure switch senses the pump is running & low water pressure. Temperature HI-LIMIT sensor detects water above factory set limits. Stack Flue sensor detects exhaust gas exceeding set points. Manual gas valve to enable safe service by qualified personal. 82% energy efficiency is the highest in its class. High-performance, affordable heating with premium features. 1-1/2" (1.5") plumbing connections supplied for easy installation. Pre-mixed combustion technology for ultra-fast heat-up. Rotating digital display - the first in its price category - provides fast, easy access for programming and monitoring. Certified for low NOx emissions. Certified for outdoor and indoor - vented installations. Available in natural gas or propane gas. 120/240 V electrical. ¾" gas line up to 50 ft. from source. General clearance required - 6" in any direction (excluding vertical). SIze: L 31.5" x W 21" x H 23". Weight: 80 lbs. The MasterTemp 125 heater has earned the 'Eco select' brand distinction as one of the “greenest” and most efficient choices from Pentair. Eco select products are designed to help you save energy, conserve water, eliminate or reduce noise, or otherwise contribute to a more environmentally responsible pool equipment system.